The Bharath Institute of Higher Education and Research (BIHER) conducts Bharat Engineering Entrance Examination (BEEE) every year. 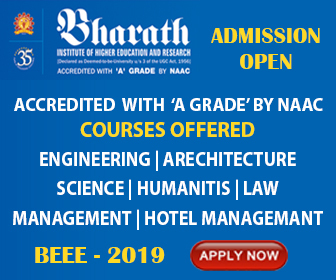 BEEE 2019 is an All India Engineering Entrance Examination Conducted by Bharath University for admission of B.Tech Degree Program through single window counseling. Courses Offered - B. Tech, B. Arch, B. Tech Lateral Entry, M. Tech, M. Arch, MBA, M.Com, MCA, B.Sc. (Hons.) and M.Sc. 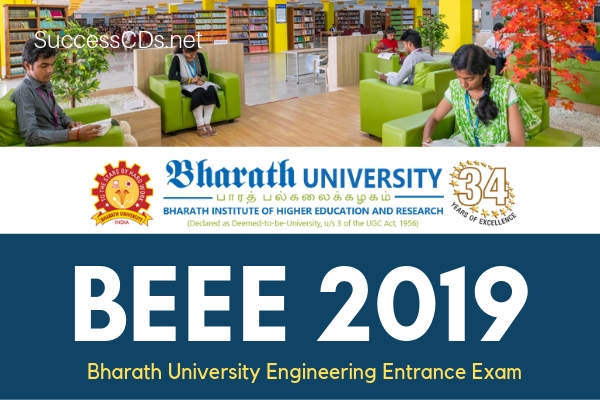 Below are all the courses that are offered by the BEEE, Bharath University Engineering Entrance Exam 2019. Mentioned below are all the eligibility criterias that are required to apply for the BEEE 2019 exam. A pass in National Aptitude Test in Architecture (NATA) conducted by the council of Architecture. However, the candidates have to apply in the prescribed application form for admission to B.Arch. Program. Note: Candidates of qualifying exam can also apply on provisional basis. but at the time of admission such a candidate shall have to produce the original certificate of having passed/Marksheet from the respective examination provided that he/she fulfills the eligibility criteria. Failing to do so, the admission shall stand cancelled. Merit List A merit list will be prepared based on the total marks secured in the BEEE 2019.